As we were traveling to various sites, my Ecuadoran guide told me we would be visiting a very unusual factory in a small town on the equator, Cayambe, a largely agricultural and dairy farming community of about 30,000 situated at the foot of the dormant Cayambe volcano. After he parked the car on the main street of the small town center, we walked a couple of blocks east past several flower shops, then turned right to pass a couple more before entering a courtyard that held three small buildings, street vendors hawking their wares, and some tables shaded by trees. On entering the center building, it became obvious my guide’s use of the word “factory” was accurate, but it was also intentionally tongue-in-cheek. Although there is no sign of the machinery or automation one might expect in a traditional factory, and the interior is about the size of an average pizza parlor in the U.S., the building does indeed house a factory — and the product is melt-in-your-mouth, buttery, shortbread-like biscochos, or biscuits. Made by hand and baked in a wood-fired oven, these biscuits are a traditional Ecuadoran treat, especially popular during the Christmas season. 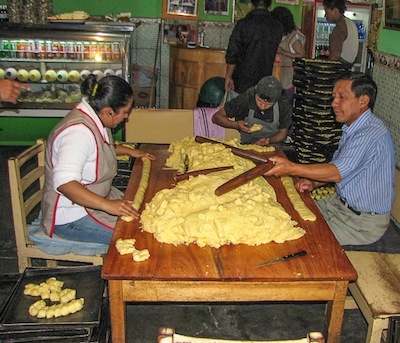 However, these biscuits, baked daily by the hundreds, are also shipped from this little one-room factory throughout the year to all corners of Ecuador and other parts of South America. 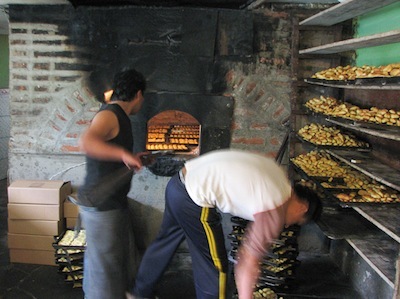 If you are on an equatorial quest to straddle the hemispheres, to balance an egg on end, or to compare the direction water swirls down a sink drain, be sure to stop along the way for some fresh biscuits in Cayambe, a stop that will add a very tasty experience to your travels within Ecuador.